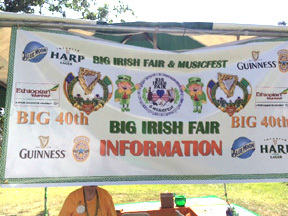 The Irish Fair Foundation provided a banner which also noted the sponsors for this long-running event--40th Anniversary! A PARADE!! The villagers and warriors from the exhibits participated in the afternoon parade. 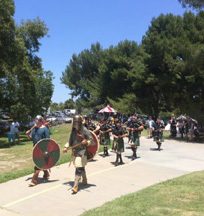 The Irish Eight Clan had banners and flags preceding them with a bagpipe band behind. 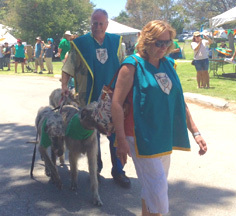 Some of the Ambassador Volunteers (Bruce and MaryAnn) with one of the 8 Irish Breeds of dog (2 Irish Wolfhound-Darcy and Delaney) highlighted at the Fair. 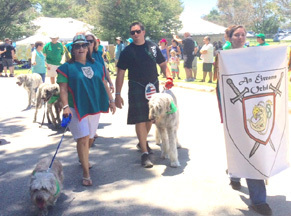 The tabards sported the Irish 8 Clan crest. 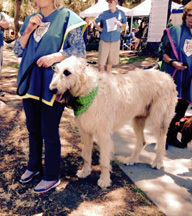 Our Beloved Glen of Imaal, Bogey, looks at Darcey, the Irish Wolfhound, with stars in his eyes... A nice tall lady to accompany him in the Parade! 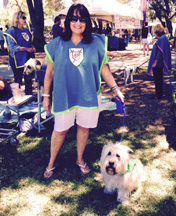 Ambassador Jane with Tonks (an Irish Wolfhound) after the Parade, just chillin' in the shade. 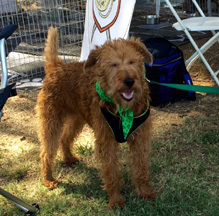 You can't get more Irish than an Irish Terrier! One of the Irish Eight Clan. In 2015, the Fair provided a look at six of the eight. Plans for 2016 include all eight of the National Irish dog breeds! Here he is again, folks! Bogey, ready to Parade his stuff! Such a personality! And who is that in the background? The Irish Red & White Setter! She was our youngest participant at just 6 months old...and a REAL TROOPER! 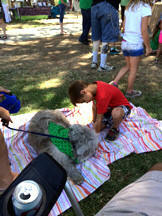 Who can resist--a boy and a dog? Getting ready for the afternoon Parade. 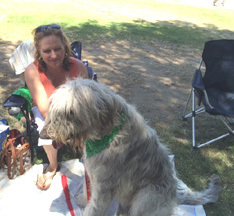 Chief, an Irish Wolfhound, with Ambassador Linda, wait in the shade near the parade starting point. The Tall and Small of the Eight! 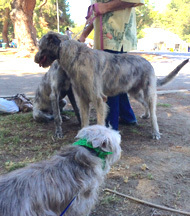 The Glen of Imaal (L) and the Irish Wolfhound (R) Our Banner Commander, Jillian, help manage exercise and guardian duties through the day. We hope you'll visit us often for new and wonderous adventures of THE IRISH EIGHT.